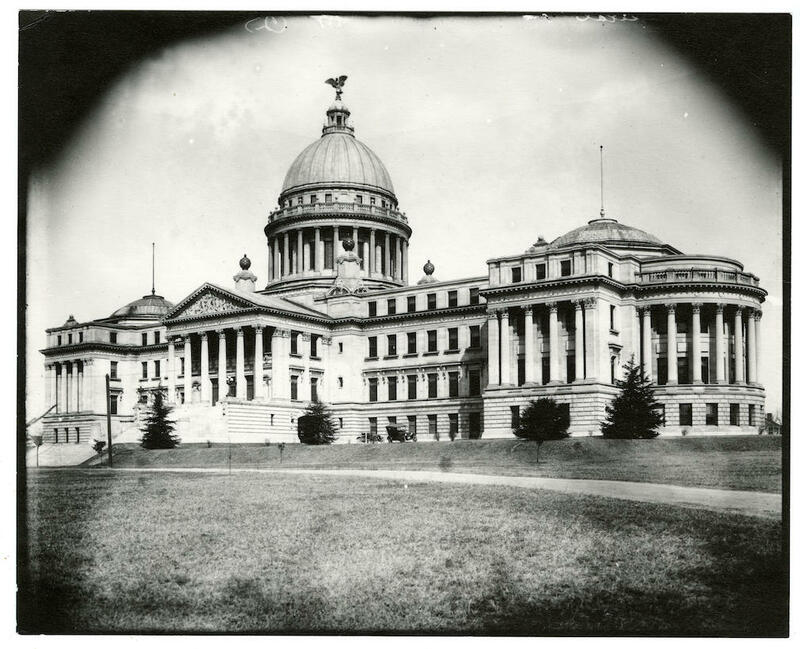 Mississippi’s current capitol building, commonly referred to as the New Capitol, is actually well over a century old. Dedicated in 1903, the building is the third capitol facility constructed in the city of Jackson and has now served as the seat of Mississippi’s government longer than all of the previous capitols combined. The New Capitol was born of dire necessity. By the 1890s the Old Capitol, which had been constructed in 1839, stood in desperate need of repair. The building was also not large enough to house the growing government. Leading citizens began advocating for a new building by 1890 as conditions in the Old Capitol steadily worsened, and in 1896 the legislature appointed a committee to solicit bids. Constructing the New Capitol proved contentious. The legislature and Gov. Anselm J. McLaurin spent four years debating where to locate the building and how to choose a design. Many politicians wanted to tear down the Old Capitol and build the new facility on the same site, but others preferred the spot a few blocks away where the State Penitentiary stood. Disillusioned by the lack of progress, McLaurin’s successor, Andrew H. Longino, made construction of a new capitol a top priority when he took office in 1900. Within a matter of weeks, he had appointed a new State House Commission to oversee construction of a capitol on the State Penitentiary site. St. Louis architect Theodore Link was chosen for the job, and construction began on 1 January 1901. The structure ultimately cost just over one million dollars, money that came from back taxes owed by railroad companies. Designed in the Beaux Arts style, the New Capitol incorporates elements from several classical architectural forms typical of the late French Renaissance. The building is 402 feet long and 225 feet wide and is topped by a solid copper eagle coated in gold leaf. The pediment of the main portico is decorated with fourteen figures symbolizing Mississippi’s artistic, intellectual, and economic heritage. Its elaborately decorated interior includes Bedford limestone and Georgia granite as well as Vermont, Black Belgian, Italian, and New York marble. More than four thousand electric lights (a recent invention at the time of its construction) illuminate the interior. A massive dome rises 180 feet above the floor and features four murals depicting important scenes in the state’s history. The building was dedicated at a daylong public ceremony on 3 June 1903. The event, attended by a wide variety of citizens and reporters from throughout Mississippi and neighboring states, included the laying of the cornerstone and addresses by Gov. Longino; Bishop Charles B. Galloway of the Methodist Episcopal Church, South; and Chief Justice A. H. Whitfield. The celebration culminated with an evening reception in the illuminated building. After three-quarters of a century of service, the New Capitol, like its predecessor, required extensive repair. After renovations that took four years and cost more than nineteen million dollars, the facility was rededicated on its eightieth anniversary, 3 June 1983. The New Capitol has been designated a Mississippi landmark building and is listed on the National Register of Historic Places. It continues to serve as the headquarters for the state’s legislative and executive branches of government and remains open to the public.